On a brisk winter day seven months ago, three young men from Jerusalem named Moshe Li, Gideon Fan and Yonatan Xue showed up at the military induction center in Tel Hashomer to formally enlist in the IDF. Along with thousands of other young people, they were going through an Israeli rite of passage early that morning, setting aside some of the best years of their lives to protect and defend the Jewish people. The usual mix of excitement, angst and patriotism was in the air, as parents hugged children and friends embraced one another, cognizant of the weighty step they were all about to take. Ostensibly, though, there was nothing out of the ordinary about the scene, which repeats itself a number of times throughout the year. But what made Li, Fan and Xue's journey so unique was the history they were making, as they became the first group of Chinese Jews to don the olivegreen uniform of the Israeli army since the modern rebirth of the Jewish state. The trio all hail from Kaifeng, China, and are descendants of the city's Jewish community, which flourished for over a millennium before assimilation and intermarriage brought about its collective demise in the 19th century. They had traveled a long way, geographically and Jewishly, to reclaim their roots and rejoin the nation of Israel. And what's more, these three young men, all of whom were 25 at the time, would have been forgiven had they not served, as the Israeli military has a decided preference for young and impressionable 18-year-olds. But ever since coming on aliya in 2009 thanks to Shavei Israel, the organization that I head, they were insistent: We want to contribute to our country and our people. 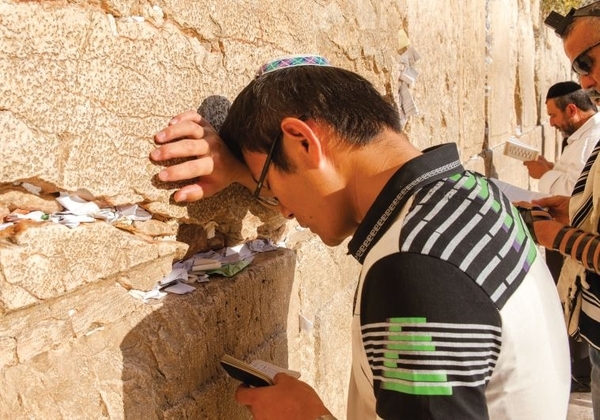 After enduring some prolonged bureaucratic nightmares which might have broken lesser men, they completed their formal conversions back to Judaism along with four other Kaifeng Jewish descendants, and then set about the task of learning Hebrew and becoming Israeli. Simultaneously, they all approached the IDF conscription office and submitted the same, plaintive request to serve. And the answer they received was slow in coming but adamant: Thanks, but no thanks. For months, Li, Fan and Xue persisted, refusing to accept no as an answer, in the process clearly demonstrating that they had imbibed some of our local Israeli customs rather well. Finally, thanks to the intervention of former IDF chief rabbi Brig.-Gen. (res.) Avichai Rontzki, the young Chinese Jews saw their dream fulfilled as the army relented and agreed to accept them into its fold. Upon receiving the news, I met with the three of them to offer my congratulations and best wishes as they embarked on a new chapter in their lives. But when I asked Li why he was so insistent on serving, his answer struck me like a Zionist thunderbolt. Looking me straight in the eye, and without a drop of cynicism or sarcasm in his voice, he declared: "My ancestors lived in China for over 1,000 years before assimilating, so they didn't do anything for Israel and the Jewish people. I want to make up for that. I want to do something." The symbolism of that moment, as well as Li's dedication to Israel, is powerful and highly emotive, embodying in a microcosm the tentative rebirth that is taking place among the remnants of Chinese Jewry. Jews are believed to have first settled in Kaifeng, which was one of China's imperial capitals, in the eighth century during the Song Dynasty, or perhaps even earlier. Scholars say that they were Sephardi Jewish merchants from Persia or Iraq who made their way eastward along the Silk Route and settled in Kaifeng with the blessing of the Chinese emperor. The Jews quickly established themselves in the city, where they found an environment of tolerance and acceptance, in sharp contrast to much of the rest of the Diaspora. In 1163, Kaifeng's Jews built a large and beautiful synagogue, which was subsequently renovated and rebuilt on numerous occasions throughout the centuries. At its peak, during the Ming Dynasty (1368-1644), the Kaifeng Jewish community may have numbered as many as 5,000. By the 17th century, a number of Chinese Jews had attained high ranks in the Chinese civil service, but along with success came the blight of assimilation – which took an increasingly heavy toll on the community and its cohesion. As a result, by the mid-1800s, the Chinese Jews' knowledge and practice of Judaism had largely faded away. The last rabbi of the community is believed to have died in the early part of the 19th century, and the synagogue building was all but destroyed by a series of floods that struck the city in the 1840s and thereafter. In the 1920s, a Chinese scholar named Chen Yuan wrote a series of treatises on religion in China, including "A study of the Israelite religion in Kaifeng." Yuan noted the decline the community had endured but took pains to recall that the remaining descendants still tried as best they could to observe various customs and rituals, including that of Yom Kippur. A decade ago, on a visit to the city, I came to meet dozens of young Chinese Jewish descendants, all of whom were clamoring to learn more about their heritage and reconnect with Israel. Since then, Shavei Israel has brought more than a dozen on aliya, most of whom now live in Jerusalem, forming the nascent core of a Chinese Jewish community in the capital. One young Chinese Jew, Yaakov Wang, dreams of going to yeshiva to study for the rabbinate, which would make him the first Chinese rabbi from Kaifeng in more than 200 years. Others have completed the tour guide course offered by the Tourism Ministry, and now work with the growing numbers of Chinese tourists visiting our shores. But whatever the future may hold for them, these young pioneers from Kaifeng are grateful to be in Zion, which their ancestors had always dreamed of. As Xue once told me, "Michael, when you brought us to Israel in October 2009, you took us straight to the Western Wall in Jerusalem, and when I stood there I was very excited. "I felt that I was at home," he continued, "I said the Shema prayer, and my deep Jewish soul was elevated. God gave me a very big present." And, I would add, He gave us all one, too.